Ms Narghis Bundhun, Barrister (Mauritius) – Is the choice of the seat of arbitration the single most important clause to an arbitration agreement? Czech Yearbook of Internatiional Law® togeher with Czech (& Central European) Yearbook of Arbitration® would like to invite you to the Fifth Annual Investment Treaty Arbitration Conference, which will take place in Washington D.C., on 5th April 2011. The International Centre for Settlement of Investment Disputes (ICSID), located in Washington, DC, is the leading international arbitration institution devoted to investor-State dispute settlement. In over forty years of operation, ICSID has been at the forefront of new developments in this fascinating and growing field of international law and dispute resolution. ICSID, like all international institutions, has been buffeted by the winds of change, and in particular by the exponential growth of international foreign direct investment. Although the past ten years has witnessed significant growth and developments in ICSID arbitration, some of the fundamental issues facing arbitrators, practitioners and academics continue to be the topic of heated debate. The future of ICSID, including its essential place in global economic development and its support for rule of law, is the topic of our fifth annual conference. This conference continues our tradition of focusing on four topical and pressing issues – by establishing a dialogue between some of the brightest new stars in the field and some of its most seasoned practitioners. Eight up-and-comers are preparing papers on four of the most controversial and important issues in international investment law today. On the 5 April 2011, our young authors will pair up to defend their positions before a panel of arbitrators, arbitration specialists and experts in international investment law. The discussion and debate that will follow is sure to be of tremendous value to the international business lawyer, litigation specialist or trade and investment law policy expert. The whole editorial team of the Czech Yerbooks would like to warmthly invite you to participate on the event organised by one of our cooperating institutions, the law faculty of Palacký University in Olomouc and dealing with mediation. This is one of the first events in the Czech Republic which provides an unique opportunity discuss the meadiation issues with experts dealing with mediation in different subject fields! Czech Yearbook of International Law® together with Czech (& Central European) Yearbook of Arbitration®, as a proud sponsors, would like to invite you to the Days of Law conference which will be held at Masaryk University (Faculty of Law) in Brno, Czech Republic. Czech Yearbook of International Law® and Czech (& Central European) Yearbook of Arbitration® are honoured to be Platinum sponsors of the upcoming international conferences organized by the Juris Conferences: Sixth Annual Investment Treaty Arbitration March 27, 2012, Washington D.C. http://www.jurisconferences.com/2011/sixth-annual-investment-treaty-arbitration-conference-march-27-2012/. 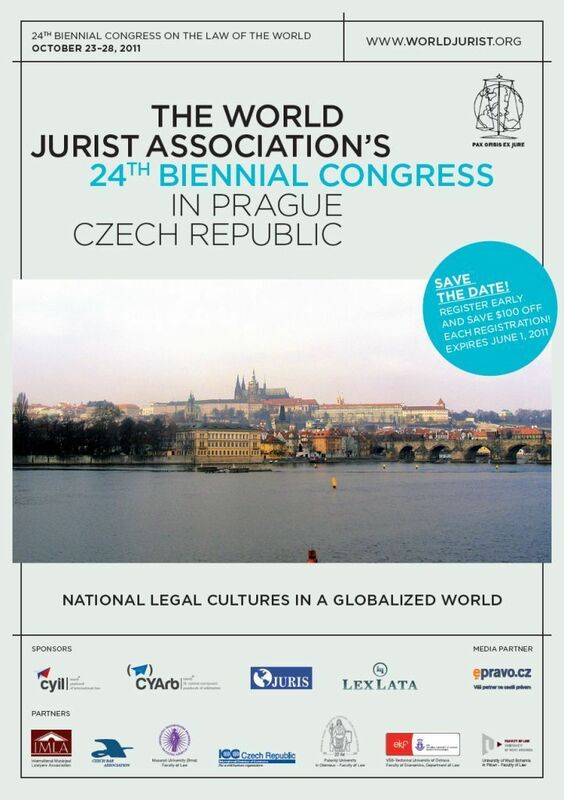 Czech (& Central European) Yearbook of Arbitration® together with Czech Yearbook of International Law®, as a proud platinum sponsors, would like to invite you to the Eighth Annual Leading Arbitrators’ Symposium on the Conduct of International Arbitration http://www.jurisconferences.com/2011/eighth-annual-leading-arbitrators-symposium-on-the-conduct-of-international-arbitration-2-april-2012/.